You are here: Home / Turntable Reviews / What’s the Best Entry-Level Turntable? 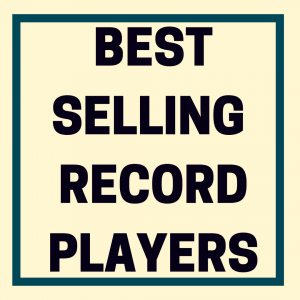 Vinyl records are enjoying a resurgence in popularity with many artists opting to release their albums on wax in addition to the digital format. 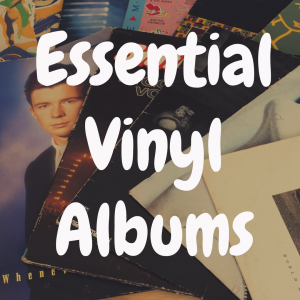 You might hear people talking about how vinyl sounds better than formats such as MP3 or CD and would like to jump head first into this music medium. 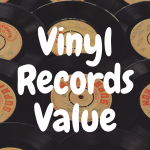 Jumping into the vinyl hobby can be a little more intimidating than buying some MP3’s however, as understanding what equipment you need and all the vinyl terminology can be daunting to say the least. 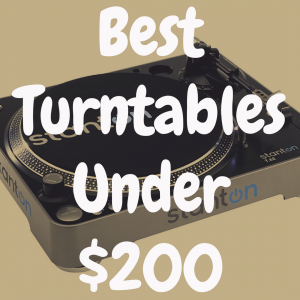 It doesn’t have to be intimidating or scary though, and in this article, we will go over a handful of really great entry level turntables. 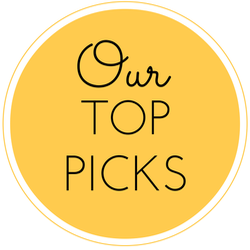 In doing so, we’ll explain their features, compare and contrast them all of them, and hopefully give you a better idea of the turntable that meets your needs and budget. Before we jump right into talking about the players themselves, I think it’s important to have a little better understanding of features to look for in a turntable as a beginner. -Phono Preamp: This is one of the most important things to be aware of when you are considering any turntable that is stand alone and is not part of a combo style, all in one setup, or a record player with built in speakers. The audio signal that gets created by the record player needs to be amplified to be heard and that is where the phono preamp comes in. Many turntables will include an onboard preamp, however, if that’s not the case, you need to be certain that the stereo you are going to plug your record player into has a phono input. If not, separate external phono preamps can be purchased and used. Most newer turntables will include an onboard phono preamp, and many will have the option as well to bypass it if you have one on your stereo you would prefer to use that instead. -Direct drive or belt drive: This refers to the method used to make the platter (the thing that you ultimately sit your record onto) spin. Direct drive, like it sounds, spins the platter directly with a motor, and as you probably guessed, belt drive spins it indirectly using a rubber belt. 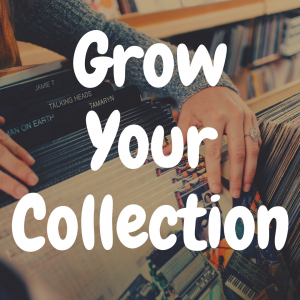 Well, as a beginner it probably won’t matter that much initially, though this is something you certainly want to be aware of as you become more comfortable in the world of vinyl. Oftentimes, belt drive has the advantage of reduced noise levels being transferred from the motor to platter to be picked up by the stylus and sent through your speakers. Direct drive, on the other hand, has the advantage of more consistent rotation speeds, which means reduced distortion form, wow, and flutter. Direct drive is also favored by DJ’s since they can be spun in reverse. Some people also prefer the reliability offered by direct drive because of its simpler design. -Adjustable pitch control: This is related to my last point about wow and flutter. As belt driven turntables age, the belt can stretch out which can cause noticeable negative changes to an albums pitch. Adjustable pitch control is often added as a feature to compensate for this phenomenon, as well. -Manual vs Automatic : A manual turntable simply refers to the idea of you needing to lift and place the tone arm on the record by yourself in order to play it. An automatic turntable, by contrast, requires that you simply place a record on the platter and press a button (sort of like a CD player) for the record to begin playing. On an automatic table, once you hit the “start” button, that action will initiate the platter, which in turn will automatically lift the tone arm, move it to first track on the record and begin playing your record. The nice thing about automatic turntables is that, should you leave the room or fall asleep, the automatic table is programmed to pick the tonearm up off the record (once the record has finished playing) and return to its original and rested position. A manual turntable, by contrast, requires you to complete those steps yourself. If you’re just starting out in this hobby, I wouldn’t get too overly hung up on these differences. Many people prefer manual turntables because they can often be better constructed and you have more individual control since it requires you to interact with the table more. But for someone looking for his or her very first turntable, you can certainly (and probably should) be open minded to possibly acquiring an automatic turntable, too. -Antiskate adjustment: The motion of records spinning cause the tone arm to pull inward towards the center of the platter. If that pull is too much or too little, the stylus will tend to ride up the sides of the groove on the record instead of directly down the center as intended. This can make the audio sound thin or distorted and will increase chances of the needle skipping out of the groove. The anti skate adjustment can attempt to correct where the stylus rides on your records to achieve the best sound quality. 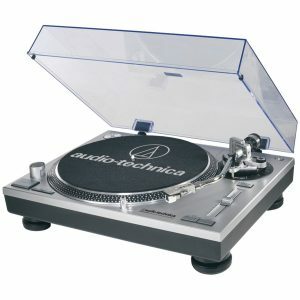 -Adjustable counterweight: Measurable in grams, many turntables will include the option to adjust the counter weight on the tone arm to influence the tone arms downward force. This is known as setting the “vertical tracking force.” Different styluses have different recommended settings, so if you plan on changing the stylus to something different than what was included originally, this adjustment could be important to have. -USB Functionality: I list this one last because it might not even apply to you, however, if you are considering transferring your vinyl to digital formats for use on your computer or other devices, USB can make this process simpler. 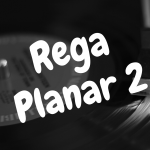 You can still of course rip MP3s off non-USB turntables, however, the process is a little more complicated and might require extra cables and hardware depending on your setup. 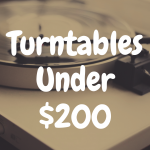 I chose these turntables for their mix of features and price points. I tried to stick with names that are recognized and respected for their audio equipment. While none of these classify as “high end,” these are five tables that can do more than an adequate job at playing your records. Starting out with the cheapest table on our list, the Jensen JTA475B is very much on the entry level side of things. The main reason I included it was because of 2 big factors. First, it is ready to go right out of the box. It even includes a tape deck and CD player as well. No, you won’t get the quality and nicer features of some of these other turntables on the list, but for around $100, you can be ready to listen to records right away with nothing else needed by you as far as equipment. The other feature this player has that almost none of these other ones have is the ability to play 78 RPM records. 78’s are not super common, but if you have some, this can play it. 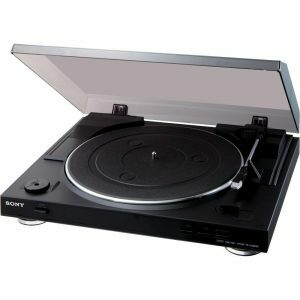 The Sony PSLX300USB is a pretty solid turntable with a good balance of features and price. It is belt driven and features fully automatic operation. It has an onboard phono preamp, which can also be switched into bypass mode if your amplifier has one you would prefer to use instead. 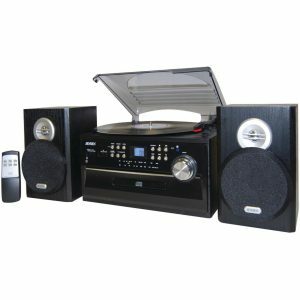 It has a USB connection for converting your vinyl to MP3 on your computer, too. Some features lacking on this turntable is variable pitch control, tone arm counter balance settings, and antiskate adjustments. 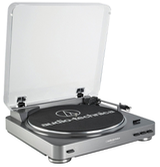 The Audio Technica AT-LP60 is another fully automatic belt driven turntable like the Sony we just talked about. It has an onboard phono preamp that can also be bypassed if desired. This is a nice beginners turntable in the sense that it is simple, reliable and ready to be hooked up to some speakers, headphones or an amp right out of the box. While not a huge deal in and of itself, this turntable is one of the few on the list available in a variety of colors besides black. Features this turntable lacks is a USB output, variable pitch control, tonearm counter balance settings, and antiskate adjustments. Most of these features are ones that you would get inside a more expensive, manual turntable. This turntable includes all the features I have mentioned earlier in this article as important to look for in a turntable. It has a built in preamp, adjustable pitch control, adjustable tone arm counter balance, antiskate adjustments and USB hookups. 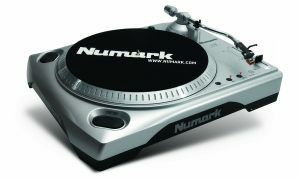 Even though Numark makes a lot of gear that’s aimed towards the DJ crowd, I personally feel like this turntable offers a really good mix of features for the price, even for the non-DJ. Something to note that it lacks however, is automatic playback and a dust cover. This is a nice turntable, and it’s also the most expensive on our list. It is the only one featured that is direct drive, as well. The LP120 USB It has an onboard preamp and an adjustable pitch control that has a wider range of adjustment compared to the Numark (+/- 20% instead of 10%). It also features adjustable antiskate and counterbalance, as well. 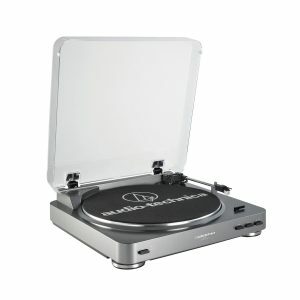 It has USB connections, and is a 3 speed turntable that can play 78 RPM records as well as 33 and 45’s too. If you’re just beginning on vinyl record-playing journey, note that any of these turntables are perfectly fine for your initial purchase. With that said, it’s important to know that some turntables are no doubt better than others, and if you’re sacrificing features (and to some degree quality) in order to get a cheaper entry-level table, that’s perfectly fine. Just know that at some point—be it 12 to 24 months—you’ll likely want to replace that turntable with a much more improved record player.